Hi guys! For my final project, I’ve created a blog for sharing and preserving superstitions about objects from around the world. I’ve gotten a few comments so far, so be sure to check them out. Also, if you know any superstitions about objects that you’d like to share, please do!! I’m new at blogging (it took me FOREVER to get my blog to look the way I wanted it to) and I can’t figure out how to have posts show up under my tabs/pages instead of just on the homepage. If anybody knows how to do this, please let me know! Thanks! My idea for the final project is inspired from my team teaching project and a digital photo class I took last semester; it is to capture the essence of my late father through his objects. Throughout the course of this semester, we have been focusing on the owners relationship to his/her objects and how (if the objects have some attachment or value) a part of that person is captured in them. I will create a series of scans (around 3 or 4) cluttered with my dad’s belongings in a certain compositional way that expresses who he was as a person. Even when the person is no longer here, the objects left behind can tell the story of who that person was, even to people who have never met him or her. The objects in the prints will be assorted in chronological/significant/symbolic ways that will best represent who my dad was as a whole person through some of his most valued objects that my family and I have. We have a lot of his belongings, but some objects would not fit on a scanner and some other ones are with other family members. I had my mom send up to me an assortment of his objects that will capture my dad’s history or essence since he came into and out of our lives. I will have prints of my photos to show to the class, along with a short essay explaining what I have done. Professor Mulready suggested that I write an introduction along with something possibly inspired by our read, Taking Things Seriously. Since I will be presenting several objects here, I am basically going to map out each object (and it’s transition into the series) and explain how it embodies a part of my dad. For my final project, I will be elaborating upon the research Sam and I have done for our team teaching assignment, involving architecture as materials and culture. 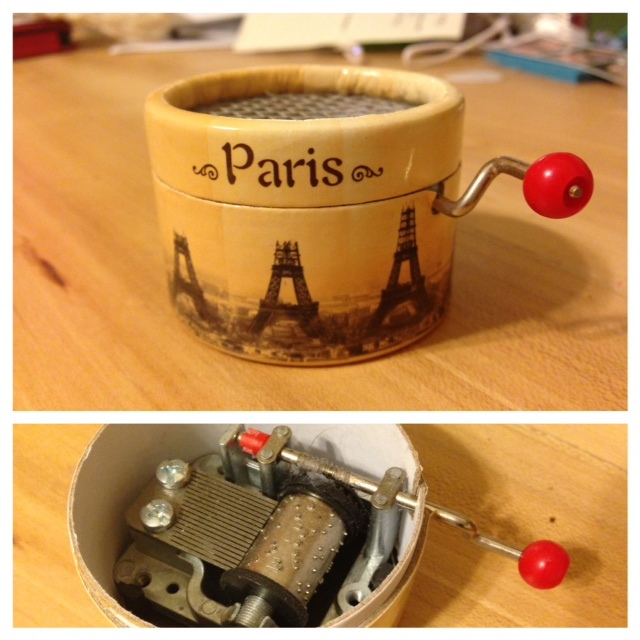 As pictured above, I purchased a music box upon one of my many visits to Paris while I lived abroad. The music box plays “La Vie en Rose” by Edith Piaf and depicts the construction of the Eiffel Tower. I will be exploring how the Eiffel Tower has come to symbolize French culture despite the country’s official resistance to its creation for the World Fair. I will also be researching why specific monuments are so effective when used for memorabilia such as my music box, and ponder whether or not the reduction of a country to one symbol is a positive or negative manifestation of human materialism. I will also look into the same phenomena for other countries (although not in as much detail), and try to find connections between what we know of the country modernly and what their famous monuments tell us about their history. This will be particularly focused on countries that are still developing and the image they intend to create through their architecture compared with historical architecture. I would love to hear what some of your questions are about this topic so that I could make sure to answer them in my project. For my final paper, I am going to write a chapter for my novel, Lucid: I’m Wide Awake, centered around the notion that objects carry a potential to fully consume human beings. I will provide a quick brief on Lucid and its characters that is relevant to this assignment so that the sample can be understood. This chapter is centered around my protagonist’s twin brother, Darius. Josephine, the main character of the Lucid trilogy, is a nineteen year old female that is, at this stage in the arc, at the very rock bottom of her character development. It is Saturday morning, and Josephine is supposed to be watching her Darius while her mother is at work. Darius is severely affected by autism. In the moment below, Josephine is currently out getting cigarettes and has left Darius alone in the house and to his own devices. He has just woken up and soon becomes very overwhelmed by a glitch in his massive collection of New York City Memorabilia. Autistic individuals are often prone to developing obsessive behavior around movies, music, place, and, in this case, a very specific type of memorabilia that is often repetitive (how many Statue of Liberty figurines have we all seen? ), and actually serves as a soother to Darius’ anxiety when he knows his collection is dusted, counted, and in order. Here is a sample of the chapter. Enjoy! Fifty. Darius ripped his covers off the bed, feeling his bladder twitch inside his pelvis. Fifty. He had just finished counting his collection of New York City Memorabilia, and could now allow himself to take his morning pee. He could finally let himself get out of bed, and let his toes crunch against his polyester rug that had turned his bedroom floor into a giant map of the New York City Subway System. Ashley had found the rug on the MTA website, on sale just before Christmas, and thought it was a perfect fit for Darius’ room. It was a new rug, fresh and clean and stiff against Darius’ feet. He stood up, his long bones popping in response to movement after his brief, hour-or-so rest. There Darius stood, starting his daily routine of taking in his surroundings and putting the pieces together. He saw the sun shining, so thus, it had to be daytime. Usually, during daytime, he was at Hoboken High School without Mommy or Josie. He spent his days in a contained classroom, with other boys his age (Chris, Lee, Joel, Rohit, Ivan) and one girl (Stephanie) that were like him. He attached minimal significance to these other kids, possessing no desire to become friends with his peers or even associate with them in any way. All he knew was that Chris brought in salad for lunch every day with very pungent, oniony dressing. Lee needed to pick up every stick he saw on the way to school and bring it into the classroom. Joel made loud noises in the bathroom that gave Darius a headache, and Rohit made no noise at all. Ivan wore diapers that stuck out of his pants. Stephanie would sing the songs from Annie every day during breakfast in the classroom, an activity during which his teenage classmates would be reminded how to hold and knife and fork, and she was sometimes so loud that Darius could smell her breath across the table. Her parents clearly did not take the time in the morning, as Ashley did, to make sure she brushed her teeth. But this daytime Darius did not see Chris or Lee or Joel or Rohit or Ivan or Stephanie. He had woke up in his bed, and was now standing on his new rug in his underwear. If he was not at Hoboken High School, that must mean it was what Mommy called a Fun Day: the weekend. He smiled wide, realizing that he did not have to go on the cold yellow bus or smell Stephanie’s breath over his freeze-dried eggs. This morning, he could have pancakes for breakfast, since it was a Fun Day. His stomach rumbled inside his sunken torso – he couldn’t wait for the sweet, syrup-covered morsels Mommy made so well. She had to be in the kitchen. Either Mommy was in the kitchen, or Josie was sitting at the countertop, reading a book and drinking some water. Darius yawned and blinked his eyes, smiling at these possibilities. If it was a really good day, Darius would see both Mommy and Josie in the kitchen. They would look up and smile, and Mommy would say, as always when Darius approached in his robe, “There’s my big man!” Darius didn’t know what this meant, but he knew that it always followed with a kiss and he would feel a warm feeling deep inside his chest. Yes, he could not wait for pancakes. He systematically walked over to his closet door and opened it up three quarters of the way, as he did every single time. He grabbed the blue robe that Mommy insisted he had to wear around the house, now that he was a Big Boy, and walking around the apartment in briefs was no longer acceptable. Posted on April 28, 2013 by Ricardo A. Hernandez Jr.
To emulate Daniel Miller’s work in The Comfort of Things, I’ll be interviewing students on campus to find out what really matters to the community. As Miller’s book reveals, each character is faced with a linear story of why they have an object, why they decided to keep it and what they expect to do with these objects in the future. The objects, in ownership of each person or each portrait within the work, also has some meaning. Items include anything from a form of rehabilitation to security, from love to loneliness. In its most basic solid or liquid form, the object has representation of another subject, emotion, person, event or thing. However, objects might indicate the opposite, where objects don’t represent anything or are not seen as important to certain human beings. For example, in his chapter “A Thousand Places to See Before You Die,” Miller reveals a couple who have no attachment to objects. The portrait reveals the couple as unsentimental to objects, given their traveling experiences. For my project, I’ll be choosing students from a floor within a residence hall. In my research, I don’t want to only include one gender identity. Given that most floors are split between males and females, as of right now on campus, I have chosen to do a multi-gendered floor. It would be interesting to analyze what students value within their dorms. Dorms are interesting because most students, who live on campus, don’t usually have personal possessions within their dorms. However, I hope each person will have an object with some significance. For this project, I’ll be creating a number of videos, audio pieces and slideshows of each student after I interview them. I am concerned with the timing of the final project because it is due soon, but I think I’ll have a great batch of multimedia pieces to show the community at the end of the semester. Here’s a short preview of what I’ll be doing. 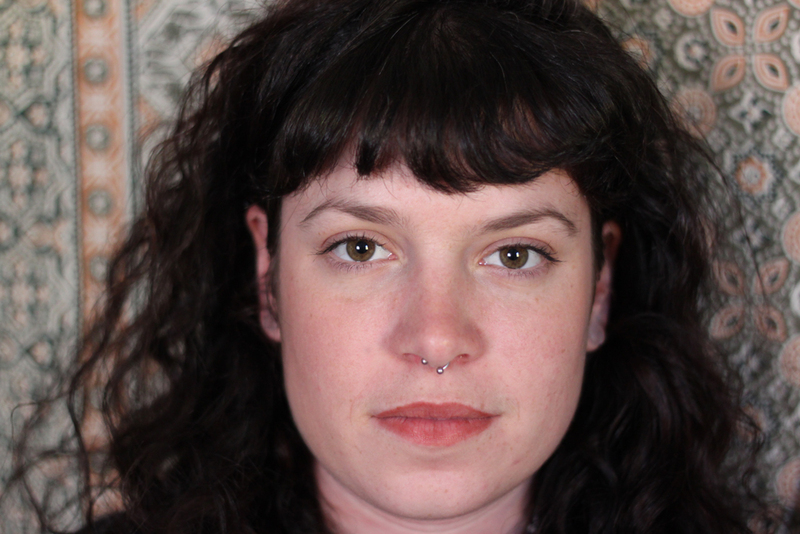 Emily Weiss is a third-year art education major at SUNY New Paltz. She shares the story behind a family heirloom which has been passed down through generations of women. Her locket and its chain has been worn during family gatherings, struggling times and war. For this project I will be asking people to think of an object that “is meaningful” to them. 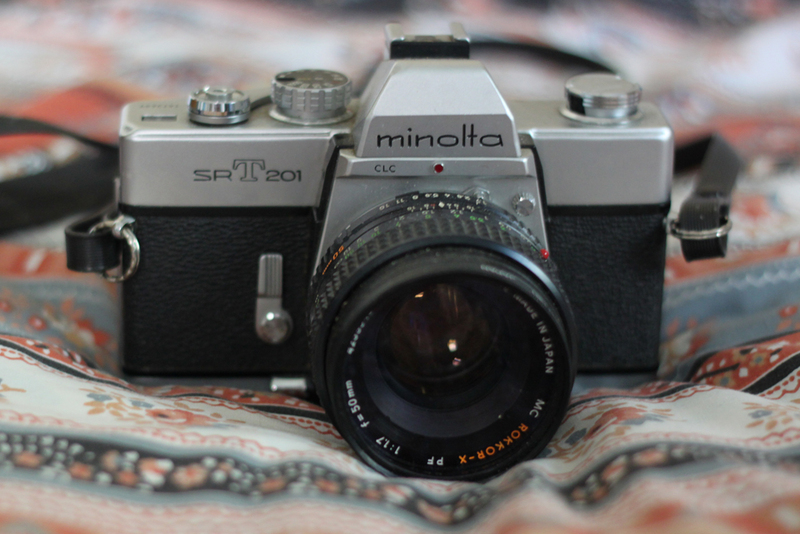 I will then photograph them and their objects, and ask them to write a short story or anecdote about their chosen object. I am hoping to portray people through the objects they consider meaningful. The portraits and object photos will be shot in similar styles. I am also incorporating a handwriting aspect, having the individuals physically write their stories. From there, I will be compiling a website and/or book of all of the photos. Ideally, this will be a rather large project. I am mostly going to have it open to college students, but I may start to include other demographics as well. That being said, if anyone in the class would like to participate, please let me know via email (sschwartz92@hawkmail.newpaltz.edu) or in class on Monday. So for my project, I’m kind of expanding on my honors thesis. For my thesis, I’m trying to undermine the stigmas that come with individuals with communication disorders through art and drawing portraits. Because of my project, I get to know these individuals a lot more and I hope to portray their beauty through my artwork. For this final project, I asked one of my friends who used to stutter severely to tell his story through an object. He chose to talk about the menorah. At first in the interview he goes in depth about the significance of the menorah in a historical and biblical point of view. Then he talks about how its relevant in his life and how it has helped him overcome so much. He is a very spiritual and religious person, so the more you read through the interview, the more you so how closely tied his life is with this menorah and all that it represents. I posted a excerpt of the interview, it is not everything that I have. Can you describe the physical object? Okay, so the menorah has seven branches and it has one sort of middle branch, like a trunk of a tree. And then there are six branches that branch from that. It’s usually gold or silver, and it usually has candles because it’s meant to be lit. It has symbols like the tree or different animals, like the lamb or the goat…because these were animals that were significant in the Old Testament, especially when it came to sacrifices, religious and ritualistic sacrifices. So they [the animals], have a profound meaning, especially in the Jewish and the Christian…but more so the Jewish tradition. I hope I expressed the physical description of the menorah. So what color is the menorah? Is it gold or…? It’s gold or silver. [It’s] most likely gold because it’s meant to emulate the original menorah. It’s also called the candelabrum because of its branches and because it has candles, and they’re lit! So it’s usually gold because it’s meant to emulate the original menorah. The original menorah was located in the wilderness tabernacle of the ancient Israelites when they were wandering in the desert to the Promised Land, and so part of the design of the wilderness tabernacle was to have a menorah. It was there to symbolize the presence of God amongst the people of Israel. And usually, in a more Christian understanding of the seven branches, they are meant to denote the seven churches that are addressed in the book of Revelations when the author, I believe his name is John, he is writing about his revelations that God gave him of the end times. But in a more sort of Judaic understanding of the menorah, the seven branches, I believe, basically stand for sort of the fullness or the wholeness of God’s promise. So the number seven is meant to stand for or represent the idea such as wholeness and completeness and peace. And sort of a fullness of God’s presence and sort of God is wholly present in the people of Israel. So this must have been a very spiritually comforting object to you. Oh yes, definitely. Whenever I looked at it, because I grew up in a Messianic Jewish congregation, and Messianic Judaism is basically an amalgamation of Jewish traditions and beliefs along with loosely, the Christian notion of Christ or Jesus Christ as the son of God, and as the promised Messiah. Or deliverer. So this is something you’ve had your whole life? Yes, pretty much my whole life. And I would look at it and I would feel comforted because I would believe that that stood for the fullness of God’s presence in my life. So I didn’t just have a part of God, I had all of God in me. In my life. Okay so, when did you realize its significance? Well, how has it been significant to you over the years? the Medieval ages and the oppression and the imperialism that took place. And we understood it, as messianic Jews, the cross to be erroneous and it did not represent the original intention or quote on quote, the pure beliefs of the original believers that were called ‘believers of the way’ or believers of who we called Messiah Yahshua, which is Hebrew for Jesus Christ basically. But there is a whole argument on sort of the linguistic meanings of those names. And so we felt that Yashua Messiah was more…was pure and it is the name of the Messiah. And Messianic Jews felt that that should not have been replaced with any other transliteration. So back to the menorah, the menorah you know, as a consequence of all of this…it’s meaning, the fullness of God’s presence… But more than just that, it’s a political message to the community that we are messianic Jews that we are distinct from Jews and we are distinct from Christians. That we’re not Christians, nor are we Jewish. But we’re sort of in the interface between the two. And so Jews would sometimes comment and say ‘well, you know the menorah is our symbol’ and so the Christians will say ‘but why are you using the menorah, that’s Jewish!’ So we would have to constantly remind or reiterate the political message of saying ‘this is our identity as messianic Jews’ and this is why, because we’re in the interface and we’re bridging Judaism and Christianity together. The way that Messianic Jews understood it was always supposed to be. I’m curious how the two connected (the menorah and speech impediment). You said the menorah or what the menorah represents, shaped you as an individual and you also said you used to stutter. Did you have times when you had trouble communicating with people, you found the menorah as being something of a comfort to you? Yes. Actually, because like I said, the menorah represents the fullness of God’s presence. And this is a God that is invisible. So in times of disbelief or doubt, I would look at the menorah and it would be reaffirming of my faith. And therefore, I would return to my strong belief that despite me having a speech impairment or severe stuttering, that I could overcome that. And my faith at the moment, regardless of the social influences that I had, was that God would help me overcome stuttering. Little did I know that it was also my community that I grew up with that helped me get over my stuttering. They pushed me to read biblical verses in front of the congregation. They also pushed me…they strongly encouraged and motivated me to eventually speak full on sermons in front of the congregation. And at first I would stutter every other word. But there came a point where the social influences I grew up with and my faith united. And even when I did eventually speak more and more sermons, there came a point where I was more enthusiastic, I was very animated when I preached, and I eventually began to more and more overcome my stuttering problem. Did you have- were you seeing a speech language pathologist at that point? And did she also encourage that too? Like was she really good about that? Actually, she was more…I guess her approach was more…because she had no idea about my religious community or my religious upbringing. Actually, that’s a lie. She knew that I did…she understood that I was Christian because I didn’t really know how to explain my Messianic Jewish faith to her, so I would just say to her I was Christian. And I didn’t want her to misunderstand that I was Jewish either. So she really knew very little about that aspect of my life. So she didn’t even know you did sermons and things like that? But you improved so much through that feedback you got from the sermons. What did she think was happening? How did they even convince you in the beginning to get up there? Well, part of it was that it was part of our socialization. And our training as Messianic Jewish children and youth [was]…to prepare ourselves to be trained in knowing the basics of how to spread the good news, or spread the gospel pretty much. Or spread the message of Messianic Judaism. And so we were trained to be spokesmen. And so I turned out to be amongst my peers, the one who stood out for some reason or the other. And I was just very into, you know, especially around the age of twelve or thirteen where I would just be very into and dig deep into the religious and also the spiritual experience of being a Messianic Jew. So these two aspects really tie in together. That’s amazing. I am. I’m thankful for the experiences that I’ve had. And it was really because of my community, because of my education, and the positive influences that I had growing up. And my faith. I would even venture to say, that all of those elements combined helped me overcome my speech impairment. And the severity of my stuttering problem. It was severe. I stuttered almost every other word. Since what age? Ever since…How young were you when you first began stuttering? I’m going to say four? And then when did it start getting better? It started getting better early teenage years, around thirteen, fourteen years old. Because I was so active as a youth leader in my congregation, and they constantly had me singing and preaching. And then in school, I was an active student in the classroom. Wow. It’s crazy because even in my life, looking back in my high school years, even without a speech impediment, I was a shy kid and I wasn’t active at all. How did you, what—How did you do that? It’s because of my faith community. Really. Because that whole socialization of being strongly encouraged. And socialize to be a spokesman. And singing helped. Growing up and singing. Singing helped so much, and that’s actually something that I left out. Singing was actually preceded sermons and preaching. Singing was something that really was sort of, one of the first steps that I took within my religious community to open up. And that’s one of the first times that I actually sort of publically performed, for lack of better words, was singing. And from there it [confidence] grew. I first sang with my sister, and then eventually I sang by myself, and then eventually that lead to sermons and preaching and public speaking and so on and so forth. Is there a specific instance you can remember as a child or whenever, when you faced a big obstacle and you turned to the menorah for comfort? Well throughout my life, besides all the positive influences that I’ve had, and I’ve given into those positive influences and I was able to step outside of my comfort zone and speak in front of other people. Because of my stuttering problem, and I wouldn’t necessarily think this as a negative. My stuttering problem helped me develop a rich inner life. Because it sort of fostered me in a sense or shaped me to be this very introverted individual who valued the inner life a lot because of my faith and also because of my stuttering and sort of, my experience of socializing not being as easy for me as it was for others without a speech impairment. So it helped me develop this inner life which, when I did confront difficulties of which I can’t remember any situation specifically at the moment, but I know that because of that, I was also able to turn to the menorah. This also made me feel, because of my rich profound inner experience, it made me feel strange, peculiar, and weird. Like, I couldn’t fit in with my peers growing up, because no one really understood that part of me. That part of me was a huge part of myself. A huge part of my life. So menorah, simply because it stood for the fullness, you know because usually in Christian theology, and even in Judaism and even in Islam, in the major Western monotheistic religion, there’s this idea of God being transcendent and apart and wholly and God is this separate entity. This almighty, all-knowing entity, apart from the human experience, but yet, the very significance of the menorah told me that that wasn’t fully the case. That the very God that was transcendent; is also fully a part of my life and a part of my human experience. And so the fullness of God’s presence was in me. And so I could literally turn to that when I felt nervous or when I felt like I wanted to retreat and maybe not socialize anymore because people didn’t understand me. Because when they heard me stutter, that affected my self-esteem and so on. So when did you start being more comfortable in the school setting? Because it sounds like you kind of had two very different identities and experiences in school vs. your congregation. So now you’re starting to see that person in just everyday life? And now that I think about it, the speech therapy that I had and the social forces that basically combined to help me overcome my stuttering or my speech impairment, the combination of the two… first of all the speech therapy helped me pronounce words and develop a structure for me to work with and eventually develop mechanisms to overcome my speech impairment or stuttering. And then the social forces, my religious community and educators and my family members, they helped me and that whole social experience helped me and impassioned me. And so those combined really have shaped me and molded me into the person who I am today. Throughout this course, one topic that greatly fascinated me was the study of the significance of objects stemming from people with different cultural perspectives. One must always remember that all around the world, people with different backgrounds hold distinct values from their own backgrounds, and one value that has always struck me, was the way in which Italians cherished their preparation and meal time. Now, I’m not talking about Italian Americans who get together solely for “sunday dinner” and then call it a day; I’m talking about the extraordinary reverence Italians possess not just for the food they eat, but for the time spent in creating their meals and the time that is spent with their loved ones while eating. After having been to Italy, the way in which lunches and dinners took up at least two hours of the day stunned me and introduced me to this culture’s tremendous devotion to edible objects – food. Ironically enough, many months later I enrolled in this Materials of History class and this same concept popped up after going to Huguenot Street. I encountered objects saved because they reflected this exact importance of sharing meals and the value that stems from time spent among a table with loved ones. Thus for this project, I wish to discuss the parallels that Italian food culture shares with the historic Huguenots food culture. Moreover I would like to study important objects relative to cooking during Huguenot times and compare them to similar objects used that are found in Italy. On the Huguenot Street website, one of the exhibits is called: Around the Table, Early Cooking in the Hudson Valley. The page discusses the significance of cooking and sharing meals during this time and in the introduction to the exhibit the author reflects on the hearth: “The hearth was used for warmth, cooking and as a place for the older generation to teach skills to the younger generation. Food served as the bond between family, friends and neighbors making it’s preparation very important” (Exhibits at HHS). This site has given me a general introduction to function of food in this society and what really surprises me is the way in which American culture (or perhaps just New York culture), has drifted away from the beliefs that the Historic Huguenots carried. But greater factors impacted this shift to take on as the emphasis on American culture is on speed and not on rest. The webpage entitled: http://www.italiana.co.uk/theimportanceoffoodinitalianculture.html gives an overview of the importance of food within Italian culture. The page discusses the way in which all different parts of Italy take great pride in their cuisine and display this by taking much time to prepare it and taking an equal amount of time to consume it. The site also brings up the popular value within Italians – the family, and how appreciation of one’s family serves through cooking and dining. However, unlike the historic Huguenots, this tradition found within Italian culture has never changed and to this day, Italy continues to hold one of the greatest reputations in terms of their food. The website: http://italiandaycentre.com/culture.htm acknowledges Italy’s passion for food and the author writes: “The sharing of food is the sharing of joy”. Clearly, this relates back to the Huguenots’ way of viewing food and I want the class to become aware of the way in which other cultures use food to bring togetherness and harmony amongst each other. It fascinated me while I was in Italy and I hope to research it more and take the food ideals from the Huguenot culture and Italian culture and incorporate them into my life. Last but not least, I cannot give this type of presentation without bringing in (or, dare I say, cooking), some type of food for the class! However, although I am of Italian descent, I have absolutely, positively NO skills in cooking whatsoever. It is quite the shame but I have accepted that the gene simply skipped over me. So I still need to ponder about what I am capable of bringing to the table (besides this presentation). For my final project, I wanted to pursue the topic of consumer psychology. Consumer psychology is all about how consumers interact with objects, and how the design of a product influences our attitudes about it. As I began delving into this topic, I realized that there are so many different branches of consumer psychology, and each branch involves several different types of sub-categories for all the different pieces of information we take into account while consuming products. To narrow it down, I figured I would look specifically at the consumer psychology involved in designing food labels. Again, I ran into the overflow of information. While food shopping, there are so many different variables consumers take into account prior to making a decision about which product to buy. Nutrition facts, ingredients, quantity, price, and convenience are all things that influence a decision to purchase a product. Being that I wanted to focus specifically on design, I decided to set up a pseudo-study as to the influences of product design on consumers. I decided to design labels for bottled water because it would be a product that most people would be likely to purchase at some point in their lives. I wanted to avoid a product that some people might choose not to buy because they do not like it or are allergic to it. I figured bottled water was the safest bet. That being said, this is the basic outline for my research. The labels have not yet been made, but their description is detailed below (with the exception of the various placements of the logo and text, which I am still currently researching). Introduction: The basics of consumer psychology suggest that the best design for any product is one that elicits positive emotions in consumers (Bloch, 1995). According to Kaya et al. (2004), the color that elicits the most positive emotions among college students is the color green, because it reminds them of nature, trees, and relaxation. In the same study, Kaya et al. found that the color that elicits the most negative response among college students is a yellow-green intermediate color, because it is associated with vomit and feelings of nausea. Method: In terms of methods, two bottled water labels will be designed. The first will use colors, form, and overall design adhering to that of contemporary consumer psychology. It will be dark green, with white lettering and black shading. The second label will not adhere to those colors, form and overall design; it will be a yellow-green intermediate color with grey lettering and shading. The two labels will be presented to about 50 participants (25 male, 25 female). Participants will be told that each product contains the same ingredients, nutrition facts, and are of equal price. They will then be asked to choose which of the two products they would purchase, and why. Age and gender of participants will also be recorded for statistical purposes. Bloch, Peter H. “Seeking the ideal form: Product design and consumer response.” Journal of Marketing 59.3 (1995): 16. Web. 24 Apr. 2013. Kaya, H. et al. “Relationship Between Color and Emotion: A Study Of College Studnets.” College Student Journal 38.3 (2004): 396-405. Professional Development Collection. Web. 25 Apr. 2013.